Kids, Let's Have Some Fun! Ever wonder what happens to trash? Any item placed in a trash can is collected and transported up to the top of the Tehama County/Red Bluff Landfill. Check out how landfills work to learn more. What happens to my recyclables? When placed in a recycling bin, the recyclable materials end up at the Material Recovery Facility (MRF) onsite at the Tehama County/Red Bluff Landfill. Can you navigate through the Landfill Maze? Make the right choices along the way to reduce waste and help keep the landfill from growing. Recycle Rex wants to show you all kinds of cool reuse and recycling ideas that you can try too. Recycle Rex loves coloring, craft projects, and video games. 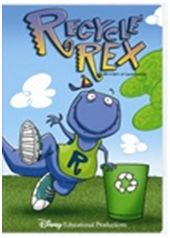 Recycle Rex is the spokes dinosaur for CalRecycle and his message is simple: "Reduce, reuse, recycle, and close the loop." Recycling is one of the easiest and best things we can do for Planet Earth. By recycling and then buying recycled products for home, school and play, each one of us really can make a difference! Check it out! Become a member of Recycle Rex’s RecyCool Clubjoin other kids in recycling and taking care of the environment. There’s no cost to join. All it takes to be a member is to pledge to recycle where you live, learn and play. Learn how to transform trash into treasures including recycled disco balls, magazine pockets, bean bag chairs, and recycled wall decals. What will you turn into treasure from trash? Hey Kids, want to learn more ways to Reduce, Reuse, and Recycle? Check out this website for more ways to make a difference.